Job opening in St. Thomas, originally uploaded by captainjay. Here's your chance to work for a great company in St. Thomas. 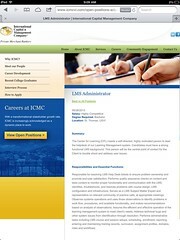 International Capital & Management Company (ICMC www.icmcvi.com/). I've been working for them for 8 months and love it. They are growing like crazy and have several positions open. I am the LMS Manager (Learning Management System) and with our customer base growing at the rate it is we've decided it's time to have a dedicated LMS Administrator/Help Desk representative. The candidate must have excellent customer service skills, technical/troubleshooting skills, ability to learn quickly, organized, multi-tasking, well you get the point. The company has awesome benefits and salaries. Summary:The Center for Learning (CFL) needs a self-directed, highly motivated person to lead the helpdesk of our Learning Management system. Candidates must have a strong functional LMS background. This person will be the central point of contact for the Client to trouble shoot and address user issues. Responsibilities and Essential Functions:Responsible for resolving LMS Help Desk tickets to ensure problem ownership and promote end-user satisfaction; Performs quality assurance checks on content and tests content to monitor proper functionality and communication with the LMS; identifies, troubleshoots, and resolves problems with course design, LMS configuration and infrastructure; Serves as a LMS Subject Matter Expert and representative on relevant community of practice calls, at appropriate meetings; Observes systems operations and uses those observations to identify problems in work flow, procedures, and available functionality, and makes recommendations based on analysis of observations; Assures the efficient and effective operation of the learning management system to meet client’s needs; Address technical bugs and other system issues from identification through resolution; Performs administrative tasks including LMS course and session setups, scheduling, enrollment, reporting, entering and maintaining training records, curriculum, assignment profiles, domains, roles and workflows. Skills and Experience:2 or more years of experience in supporting an LMS platform; Knowledge of technical data processing procedures, policies, and best practices; Excellent communication skills;Experience working within a System Development Life Cycle Experience developing use cases, test plans, and test cases; An ability to work both independently and within a team environment; An ability to work creatively and analytically in a problem-solving, fast-paced environment. Does an applicant have to have their Bachelors degree in order to be considered or can it be a work in progress? I recently applied for 2 positions at this company, but I haven't gotten a response as yet. Depends on the position, but most do require a degree. We're growing pretty quick and receiving lots of applicants. So I'm sure the Talent department has some basic requirements to start the interview process. But don't give up. It's a great company and great place to work. Good luck. I was conducting research on available jobs in Training & Development and came across an opening at ICMC. I then began looking at blogs about moving to STT and discovered yours. This has been great reading. I notice your last entry was July 2013. I hope all is well. I currently live in Charlotte, NC (originally from Seattle, WA). I'm completely unprepared to move again, but I love the sunshine and the position looks interesting. Can you shed more light on your employer? What's the culture? How is the pay (I'm a single woman/single income and I read about the expensiveness). Thank you in advance for your reply. Hi. Yes we're still on island. We started posting on Facebook and just couldn't keep up that blog. We really need to get back to posting. Our apologies for letting go dormant.